One of my big hopes for 2018 was that I would get brave enough to stop waiting for the invitations, and start being the initiator. Because of past rejection and insecurities, initiation is outside my comfort zone and there are a lot of fears involved for me. But I’m tired of sitting on the sidelines of community and missing out on beautiful relationships. I’m ready to start reaching out, initiating, and opening the door of my heart and home more — despite the awkwardness and fear that is there for me. So, with this in mind, asking if anyone lived in the Nashville area who was craving community with other women who wanted to live intentionally. If so, I asked them to message me. I had no idea if I’d hear from anyone at all or maybe a dozen people, but I was excited to see where it led. Yes, I am interested in being part of a community of women who are committed to authentic relationship. √ I’m willing to be honest and vulnerable. √ To trust other women. √ To keep conversations confidential. √ To believe the best. √ To listen and ask questions. √ To be gracious when there are differences of opinion and belief. √ To show up fully and bravely. √ To be a safe space for other women. Because of the incredible and overwhelming response, my vision for what this is going to look like has changed some. I had initially pictured that maybe 5-10 women might be interested. Instead, there were dozens and dozens and dozens of women who answered my initial post and over 40 of you who filled out the Google form. 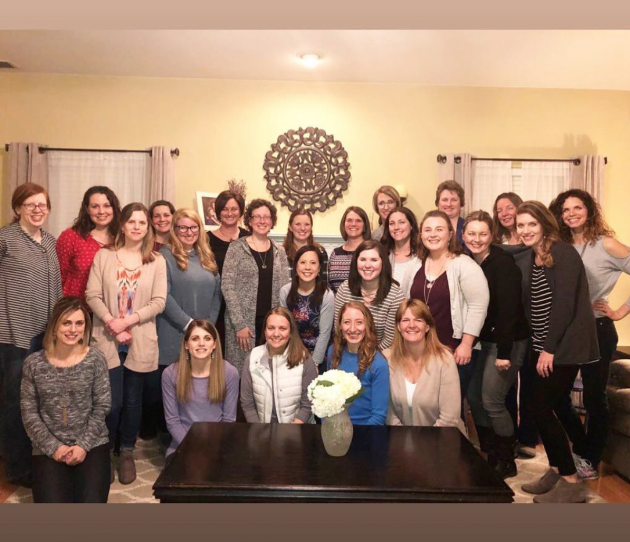 I realize that God might have something bigger here than my initial idea of one small gathering of women who meet on a monthly basis; I think maybe He’s opening the door for there to be multiple groups (maybe one hosted by you!) across the Nashville area! So here’s what I’m thinking: I’d like to invite all of you who signed up on the Google form to a Come As You Are Night on February 9, 2018 at 7 p.m. It’s going to be hosted at XXXX. My desire for this evening is that we’ll all be brave and be willing to share openly and, that by doing so, we’ll find some connections and community with other women. Ultimately, my hope is that we’ll all leave with the names and numbers of at least a few new friends that we will plan to connect with on a deeper level in the weeks and months to come. And 23 women (most whom I had never met and who had never met each other!) showed up at our house for the first Come As You Are night. These brave women showed up not know what to expect or who was going to be there. The night was filled laughter, good food, amazing conversations, and incredible openness. For those who have asked for details on the agenda, I started the evening by sharing my vision to connect women, to encourage women to get to know people in their local area, to encourage women to build authentic community, to be intentional and vulnerable. I shared how my hope for this night was that people would connect with at least a few women in a deeper way and that they might even leave with the names and information of at few women that they would plan to reach out to personally and invite over to their home or invite out to coffee in the next week or two — and maybe that become good friends in the coming months! I then had everyone go around and introduce themselves — sharing their name, where they live in the Nashville area, and telling us one interesting thing about themselves. After everyone introduced themselves, I had a list of 8 questions that I put together and we broke into groups of two and talked about one of the questions for 5 minutes and then moved on to a different person/different question. 7:50 p.m. — In an effort to help us all go deeper in relationships tonight and start being a little more authentic and vulnerable, we’re going to do a fun exercise — I have a few questions that I am going to have each of you answer… however, instead of having you share with the entire group — because I know that can be scary and intimidating, I’m going to have you turn the to person next to you and answer the question. I’ll give you a few minutes and I want to encourage you to ask followup questions, if you have time. Ask why, dig deeper, encourage the person next to you to share as much as you feel like they are comfortable sharing. Don’t be afraid to step a little out of your comfort zone in the questions that you ask. Remember: This is a safe place. And the more you are willing to share authentically, the more opportunity there is to develop relationships. 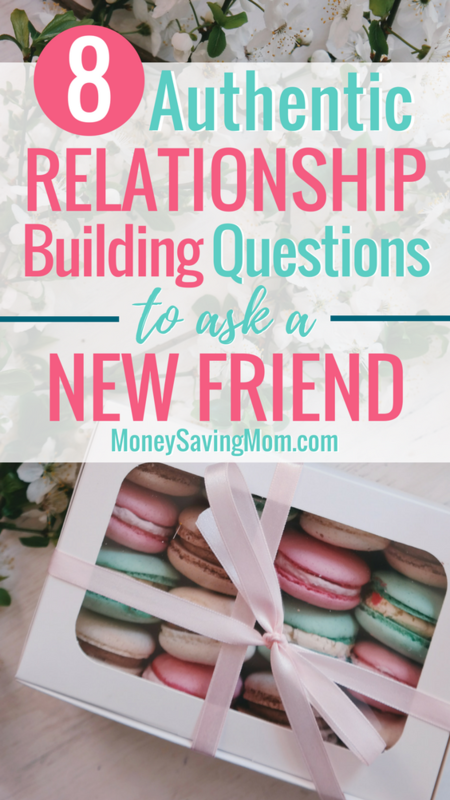 And great questions are the way to open doors to stronger relationships. Question #2: What is your favorite thing to do in your free time? Question #3: What is one of the wildest things you’ve done as an adult? Question #4: What is your greatest fear? Question #5: What was one of the happiest moments of your life? Question #6: What is one of the biggest obstacles you’ve had to overcome in your life? Question #7: When was the last time you cried and why? Question #8: What are you celebrating right now? We ended up going over the 5-minute mark for most of the question/answer time (I love that I had trouble getting the women to stop talking! ), so we only got through 7 of the questions before it was past 9 p.m. and I wanted to make sure to respect everyone’s time. It was a great way to go deep in relationships pretty quickly and to get to know a number of women in the room in a short span of time. A big thank you to my friend, Melissa, for all her help with pulling last night off and being my extroverted sidekick! And thank you so much to for inspiring me to stop waiting to be invited and to start being the initiator! I had no idea how much I was going to fall in love with this hospitality thing! I’m already looking forward to planning another night soon! attended the event and made a video sharing about how it impacted her life and she gave me permission to share it here in hopes that it would challenge some of you to step outside your comfort zone and stretch yourself, too! It’s amazing what happens when you just open the door! Who can you reach out to today? « Panda Express: Possible Free Food Item Today! So beautiful Crystal! You are so brave!!! So while it is awesome that you both put this together and were brave enough to participate, I respectfully ask if you think something is missing in this picture of 25 white women? I am white myself but I live in an extremely diverse suburb and try to think about issues of inclusion all the time. It’s fabulous that you’re reaching out. But in today’s age of recognizing our privilege, I am (again, respectfully, I truly do praise you for your efforts) wondering if there is anything you plan to do in the future to diversify your group. Crystal posted an open invitation on the internet to all women in the Nashville area and received over 100 responses. What other ideas/suggestions do you have for diversifying the group? I don’t think she had any idea what race everyone was when she organized the evening. Honestly, I can’t believe you even wrote this. Crystal put an invitation out on social media. These are the people who responded. What suggestions do you have for her to diversify her group???? Is it her fault that white women responded to the invitation? Anyone could have responded! Robin: I, too, was sad that the group wasn’t diverse when it came to race. 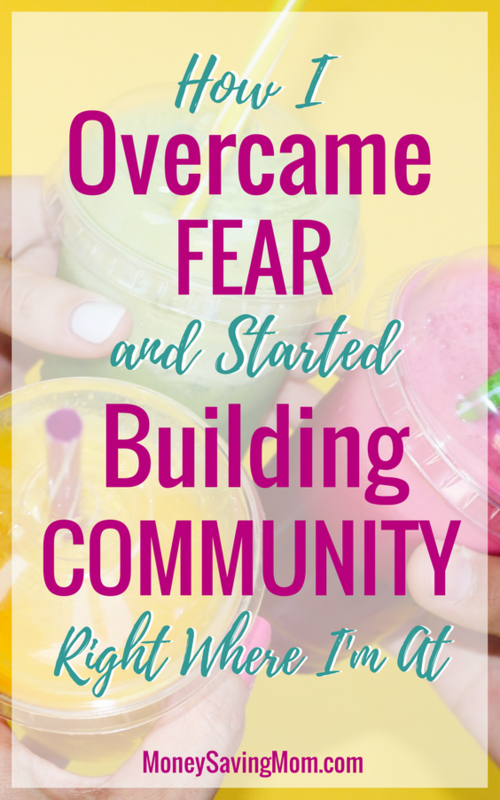 I had no control over that… as people mentioned above, it was an open invitation to everyone in this area who reads my blog — and I had no idea who was going to show up! I was really, really surprised when the evening came and it wasn’t more diverse. That said, the group was quite diverse when it came to age and background and that made me happy! Crystal, what a respectful response ? Though I noticed the lack of diversity as well, I wasn’t too bothered by it. (As I am an African American woman). We need to keep in mind a few factors, 1) this was a first event whose to say that future ones won’t be diverse especially when word gets out at how successful it was. 2) we are all working thru coming out of our comfort zone and some of the women would of like to attend but had other commitments etc. I think that what Crystal did was wonderful and has inspired me to do something in my area in the future. I put this challenge to you Robin. This can be a start of something great. Crystal, I am sorry that even when one reaches out to bring community to others in a selfless, open hearted way there will be one who will look for something to unhinge this gracious endeavor. I hope she will be as quick to offer her own politically correct group as she was to dismiss yours, however respectful. You handled it with grace. I moved to a new city three years ago and it is so hard to make friends as an adult. My son is grown and out of the house so that makes it harder, because you don’t have the relationships that develop out of interactions between children. It has been so hard! I love this idea. I just need to be brave enough to do it! I’m cheering for you as you seek to reach out and be the initiator! I just want to compliment and encourage the woman that did the video above. She describes herself as an introvert and explains how nervous she was about the event as well as all the moments of awkwardness that come with vulnerability and stretching outside her comfort zone…and yet…she did this beautiful video and put it out there for the world. Introverts often underestimate themselves. They underestimate their ability to engage and encourage people (Am I interesting? Yes! Weird? Maybe, but so is everyone else & that’s NOT a bad thing. If you don’t believe me, ask folks about their food habits/preferences. I guarantee you’ll find at least 1 thing you think is weird about their food preferences. Don’t worry, they’ll think you have a weird food preference too. Lol. Awkward? Maybe, but everyone is at times & that’s ok too.) I applaud her for showing up. I applaud her for the video. Thanks for sharing! I was SO proud of her for recording the video and letting me share it. I know that was outside her comfort zone and it took a lot of courage for her to do it — and I think it will encourage a lot of other introverts! This is so beautiful. In a world of breaking down this is the complete opposite. Thanks for your bravery to do this which inspire me to do something like this in my community. I have been thinking about it but not know or be brave enough to do it. ?? My hope is to inspire a movement of women who reach out in their local communities! I live in Middle Tennessee and would love info on how to do this in my community. This is a great idea. Thank you for sharing !! I’m in Middle Tennessee too, Niccole, and I would love to do this as well! I’m in middle TN also. We definitely need to get one started!! Hi Crystal! Thanks so much for sharing the specifics of the run up to the event and the actual event itself. I think I might have requested these specifics on Insta, and thank you for delivering! Knowing the nuts and bolts, and the good that came of the event, should hopefully help others be brave. I’m starting small and bring the initiator by inviting friends to a lunch to get to know them better or reconnect. I aspire to bring together various ladies like you did one day! You are awesome ? I LOVE that you are inviting friends to lunch! That makes me so happy! This is great! I’m a woman with Nana status to 6 wonderful grands, and always take away something from your blog… not to mention some good deals. This idea could work for any age group. But, I noticed your “come as you are” would not apply to my daily dress attire. ☺️ I guess bringing your authentic self is the primary dress code. That, I could do! I loved that we had a single woman, a few women who came who had married kids, and we had women with babies… and every age in between! We can all learn so much from each other! The woman on the far right in the striped shirt could be your sister from the picture! I had to do a double take. That’s my good friend, Melissa! I would love to figure out a way to meet others in my area that follow your blog! Oooo! I’ve never heard of an event quite like this. I want to host one!!! I’m so glad you’ve provided all your questions and procedure here so maybe we actually can put together our own. You’re so welcome! Thank you so much for your encouragement! I’m thrilled that you did this and hope it produces many new and authentic friendships. 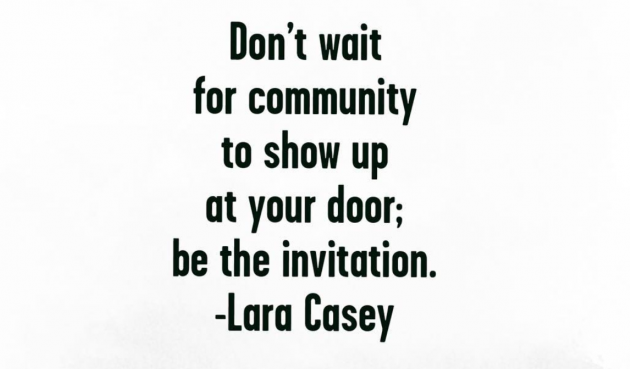 I have struggled for years with trying to find authentic community. Church is usually the first place I would look, but it seems like the model at most is that small groups are joined around Sunday school or book studies — then when the study is complete (or you change churches), the group disbands and all those “relationships” disband as well. I read about this and the author said that this usually happens when people get outside the “container” their relationships were in. I think many of us, including me, mistook “container relationships” for “real relationships” since I tend to be one of those “lifelong friends mindset” types of people. How would you suggest the rest of us (without blogs) get the word out there, to the right “type” of community we are looking for? I want to be friends with all types of people and one of my very good friends is an atheist, but I really need like-minded community to be safe with and discuss the deep and hard things of life. Great question! I would encourage you to start by just looking for other women you might already been connected with that you could invite out to coffee or invite to your house. Or maybe you even post on social media like I did. Thanks very much for the input, Crystal! Crystal, I love this idea. The only fear is I do not have a beautiful home. We bought a repo house and have been fixing it up for awhile but there are places unpainted and things that just aren’t beautiful. I have been in the homes of alit of church friends and they gave beautiful homes. I feel a bit self conscious about this. Also I have never had very many friends, only have 1 close friend at the moment…do you have any tips on how to reach out to people and host one of these meetings when you don’t have a really nice home and only very few if any close friends? We have LOTS of not-so-beautiful parts of our home — areas that need to be painted, stains on the carpet, old worn-out table and chairs, etc. I always feel like that if people are going to be bothered by my less-than-perfect home, they aren’t people I want to be close friends with anyway, because I’m just not a person who cares a whole lot about appearances. So I would encourage you that most people won’t even notice that kind of stuff. And a lot of people would appreciate and feel more comfortable in a house that isn’t all perfect! I have lots of acquaintances but only a few close friends in my local area — which is why I made the commitment to open our home every week this year — because I wanted to challenge myself to reach out more and develop more closer relationships in our area. Thank you for sharing this! I too long for some close, encouraging friendships but don’t know where to find them. have you thought about helping others connect? I’m thinking something like if someone wants to host in their city, you’d collect info for, say, 2 weeks, and then have a post of cities and a way for those in that city to connect to that person for a set period of time without putting their info on the internet (sounds like a lot of work, I know, but you might find volunteers willing to help with connecting). Just an idea. A couple of years ago I organized an event at our church that is similar to this. I asked 8 Women to host a table. They were to decorate the table with a theme. It could be anything they wanted. We had finger foods provided by the church so that no one had to bring anything. We started with a short devotion. Our theme for the night was “You Are Enough”. Then the host of the table ask a question and they went around the table answering it. After 10 minutes everyone got up and moved to a different table except the host. We did this enough times that everybody went to each table at least once. We learn things about people that we see every Sunday but don’t really get to know. We had a very light turn out due to other activities going on in the area but we still had fun. I think you have just inspired me to do this again.